In our Maths class we were looking at patterns. We found patterns on material, on paper, on bracelets and lots of other places. When we understood what patterns were we made our own patterns. We used links and made a chain with different coloured links creating a pattern. 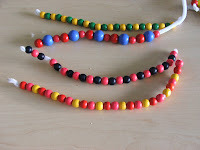 We also made our own bracelets using different coloured beads to create a pattern.